I give 8 lectures each week at our clinic. At the beginning of my lecture I always preach the importance of this being about a lifestyle change, not a diet! A diet gives us the mindset that there is an end-point or stopping point to what we are doing. When we are on a “diet” we have a goal to achieve and usually when we achieve the goal we stop what we were doing to achieve that goal. I always tell my patients to not say they are on a diet when people ask them how they are losing their weight; instead, say you have made a lifestyle change. Really embrace it and make it habitual. I believe there are 5 very important factors when making a lifestyle change to lose weight and maintain the weight loss. The first is counting your calories. Yes, I know this can be a challenge initially, but once you start doing it, it becomes like second nature. Weight loss is all about the number of calories you take in and the number of calories you put out. In order to lose one pound of weight in the course of a week, you need a deficit of 3,500 calories(500 calories/day) through diet and exercise. This means you need to cut the number of calories you typically take in and increase the amount of physical activity you are performing. The second important factor is eating and eating more frequently throughout the day. The third factor is preparing your meals in advance and knowing how many meals you will need for each day. The fourth is probably the second most important (behind counting your calories), exercising 30-45 minutes, four to five days per week. And the last factor is eating plenty of proteins. There are a number of ways you can count calories. There is the good ol’ fashioned way of writing everything down. This does require some work as far as looking up calories and serving sizes and keeping track of everything. I have a few patients who prefer this method. They say they feel more mentally and physically involved in the counting process and it holds them more accountable. The second and/or third way involves technology. 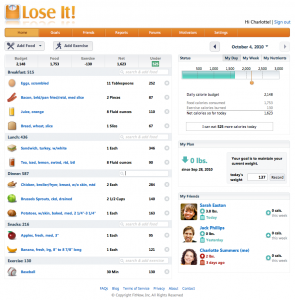 If you have a smart phone you can download a calorie tracking application. Our two favorites are Lose it and My Fitness Pal. They are both free programs and have bar code scanners. For instance, if you make spaghetti for dinner you can scan your box of pasta, jar of sauce and package of meat, adjust your serving sizes and know how many calories, how many grams of fat/protein/carbohydrates/fiber are on your plate. You can also use the applications via the internet if you do not have a smart phone. 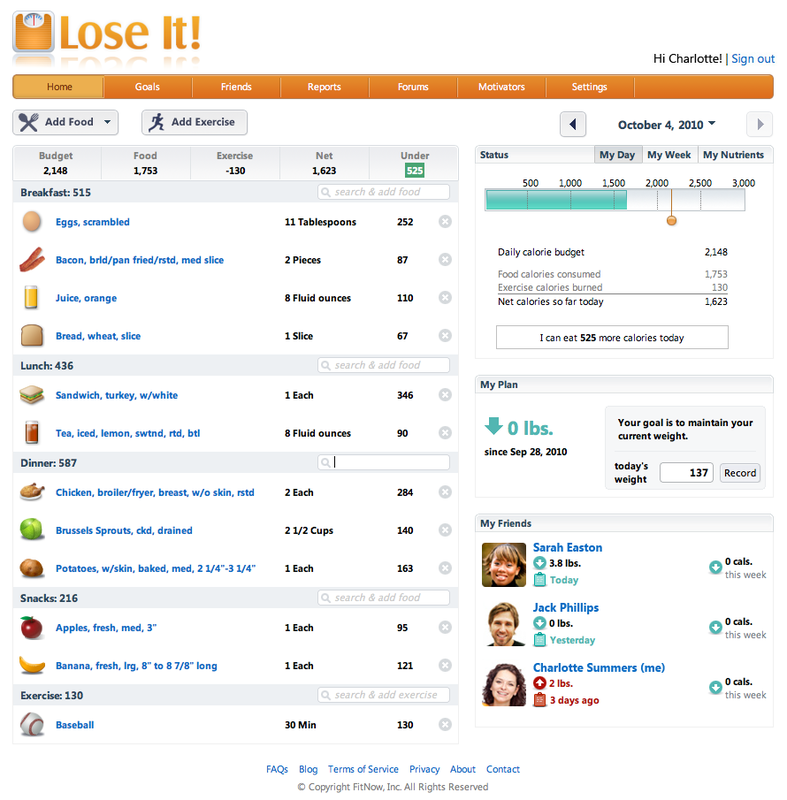 Both applications have search features in which you can search for food or beverage items and log your calories that way. The applications on smart phones are also great to use to help you choose a sensible meal when eating out because you can review food items and calories before you go to a restaurant. You can also track/log your daily exercise and get a more accurate account of the number of calories you are burning during your activities. Both applications are also available on the websites and calories can be tracked on-line if you do not have a smart phone. We recommend you eat 5-7 small meals per day. Try to eat approximately the same number of calories for each meal. This will help you maintain your metabolism at a more efficient level. Eat breakfast within the first hour of waking up in the mornings and get your metabolism ignited to its peak! Figure out how many meals you need to take with you each day. Try to prepare your meals in advance (i.e. the night before) for your entire day. Are you leaving from work and going directly home? If not, make sure you pack a meal to eat where ever you are going to be so you do not ruin what you have done well all day by running through a fast food restaurant because you are hungry and don’t have a meal with you. Exercise is a VERY important component of weight loss and maintaining your weight loss. Weight loss and maintenance really doesn’t work very well without exercise. Exercise has numerous health benefits for you beside just weight loss or maintenance of weight loss. We suggest you exercise for a total of 30-45 minutes, four to five days per week. This does not have to be performed all at once; feel free to break up your exercises and perform 5-10 minute bouts of exercise several times each day. Try to incorporate more and more physical activity into your every day routine. Take the steps instead of the elevator, park farther out in parking lots, during breaks at work get up and walk or walk up and down the stairs for a few minutes just to increase your activity, pull your shopping cart at the grocery instead of pushing it. 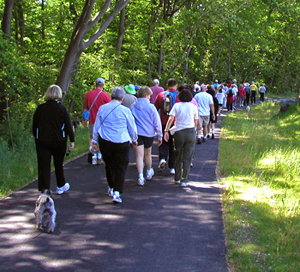 There are lots of ways you can add more physical activity to your daily routine. Proteins are helpful for weight loss and maintaining a weight loss. We recommend our female patients eat 65 grams of protein each day and our male patients eat a minimum of 75-80 grams each day. What is a protein? If it walks, crawls, swims, flies or has a mother…it’s a protein. Dairy products, lean cuts of red meat, fish, chicken, seafood and pork; beans and lentils are plant based; nuts and butters (peanut butter, almond butter, soy butter, etc) are all great sources of protein. If you plan to use a “supplement” like a protein shake or protein bar, we suggest you limit this to just two servings total each day due to the higher number of carbohydrates and sugars typically in those types of supplements. Proteins will stay with you for a longer period of time and make you feel more full and satiated. The more proteins you eat, the less carbohydrates and fats you will take in as well! If you will incorporate these five things into your daily life/routine, you will find it much easier to lose those pesky pounds and then maintain your weight loss. We all struggle with hectic lives and schedules. This will need to become habitual for you. Just like any habit, it will take a few weeks for it to stick. But keep in mind…habits are hard to break. So hopefully once you start the habit, you don’t break it! I hope this blog helps at least one person who is struggling to lose weight or are struggling to maintain a weight loss they worked so hard to achieve. Remember: make it a lifestyle change, not a diet! Make it long term, not short term. Have a great day! Get fit, stay healthy and get moving! Previous PostPrevious Healthy Eating is Possible!